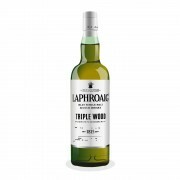 Laphroaig Triple Wood "Fewer calories, thrice the oak"
Thanks for a helpful review. Will proabably be my next purchase. Interesting. 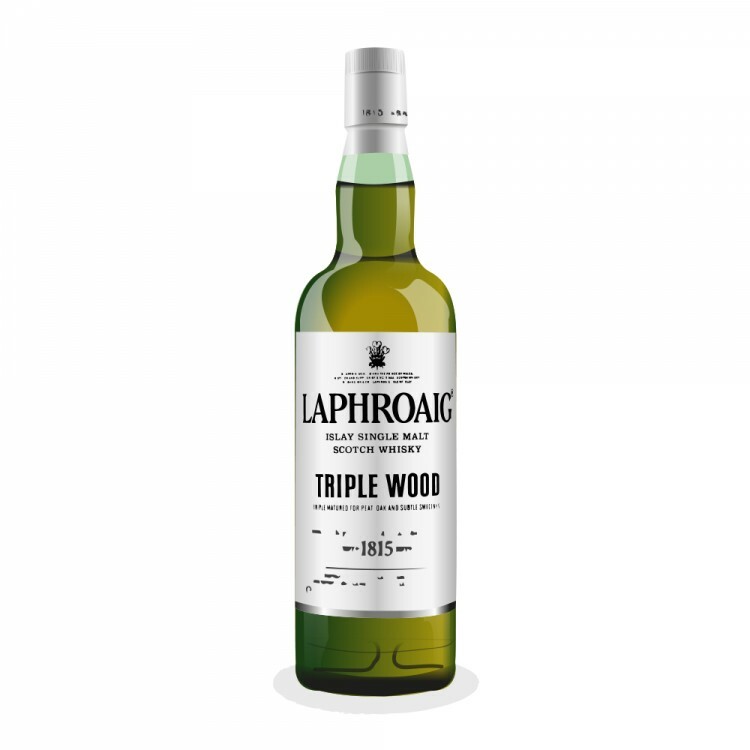 You like Triple Wood more than I did, but the last time I tasted Triple Wood was about 6 years ago. Your review makes me want to try some again right now. I then found Triple Wood a little limp, compared to other Laphroaigs. I will be very interested to see whether current batches leave me a different impression than before. I have certainly been shocked to read recent negative opinions about Laphroaig Quarter Cask, because the bottle of Quarter Cask I bought 7 years ago was fantastic, way more intense and flavourful than most bottles of their standard 10 yo. That said, I do still think of Laphroaig as the most consistently good distillery in Scotland. @Victor When I bought this, I guessed I would like it a bit more or a bit less than Quarter Cask, which I would normally score between 88-90 points, depending on the batch. I have an unopened QC, but I haven’t done the H2H comparison. That said, QC is probably the Laphroaig I’ve purchased most often, largely owing to availability, so I’m familiar with its profile. This has all the rich, deep notes I find in QC, but the sweet fruitiness adds some nice mid-range notes (if that makes sense). TW also has a nuttiness that I’ve never noticed in QC, and the sweet vanilla just sits nicely on top. Wow—three years of sherry finishing on this guy??? I never knew that. @MadSingleMalt Yup. Right from the video on the Laphroaig website. You had me at rich. Thank you for the review, I will certainly be giving the Triple Wood a try. Oh... I've seen some other good reviews of it too. Goes on the list. Only issue is that here I can get the qc for £34 and this one is £50. Well well, c'est la vie. I'll have to find this one now. I have an opened 10yo and unopened 10yo cask strength. I think triple wood is reasonably priced around here so sounds like a good next purchase. @casualtorture I’m jealous of your 10 YO CS. It’s my favourite Laphroaig thus far in my journey. @OdysseusUnbound, if ever I make a road trip up in your direction, you know what I'll fill my trunk with. @OdysseusUnbound it's plentiful currently down here. A shop downtown has triple wood for $68.99usd. I might go grab one if I have time. Need to find this one, as Quarter Cask is my favorite Laphroaig expression. Picking it up this weekend from KL Wines. In the San Francisco Bay Area, the Triple Wood is about $54 USD if anyone else is interested. @archivist that’s not bad, considering Select is about $49 in New Orleans. @mhock66 I thought it was a decent price for the Triple Wood, and I'm quite excited to try it after having read this review. Total Wine is selling it for roughly the same price, but I like KL Wines because they offer so many different weekly tastings and are a nice group of guys/gals there. The Select is around $35. @archivist FWIW, I like Select. It’s the weakest Laphroaig core whisky, to be sure. But it’s still pretty good. That said, I’m not paying Ontario prices for Select ($70). My folks picked it up last year in Florida for about $40 (I think). @casualtorture, browse the LCBO website (Vintages page). You'll get the idea quickly what these Ontario guys have been grousing about forever. Even leaving the Canadian stuff out of the equation, the pricing on Select is nuts. Not that it usually grabs too much of my attention when I browse the shelf, but I think I usually see it next to the 10 at a price of ~20% more than 10. It's never priced as the cheaper less-desirable version of Laphroaig that it is. @MadSingleMalt.....actually... On amazon UK the 10 is now £36 and the select is on offer for £26. Still don't seem worth it though from what I read here. @RikS Using a basic currency conversion, that comes out to $43.57 CAD for Select and $60.32 CAD for the 10. I’d pay $40-$50 for Select. But then, if the 10 was $60, I’d always have a few on hand. @MadSingleMalt I think he hasn't answered because he fainted from joy. @MadSingleMalt It’s not linking to anything specific, but I’m assuming you are referring to the Cairdeas Triple Wood Cask Strength...and yes, I have people working on it, and I’m meeting with my bank to take out a $10 000 line of credit. @OdysseusUnbound Are you planning for your TW stash to be equal to @paddockjudge's Legacy stash? @Nozinan Is such a thing even possible? Canada is big, but is it that big?